Peterborough have been charged by the Football Association with failing to ensure their players conducted themselves in an orderly fashion. It relates to an incident in the 86th-minute of their League One defeat by AFC Wimbledon on Tuesday. Joe Pigott scored an 87th-minute penalty for the Dons after Peterborough's Rhys Bennett was sent off for a foul on Dylan Connolly. The club have until Tuesday 19 March to respond to the charge. Meanwhile, Peterborough have been successful in their appeal against Bennett's red card. 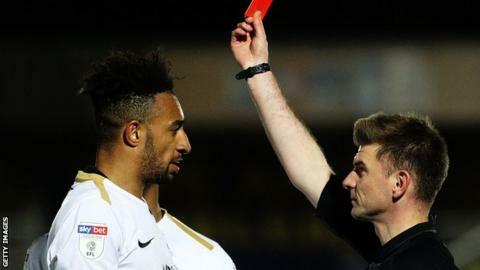 He was sent off by referee Ollie Yates for denying an obvious goal-scoring opportunity.